In the midst of a conversation regarding a netbook with a salesman at Radio Shack I overheard a man raising his voice to another salesman at the register. "This is ridiculous. I have never had this happen before." The salesman was telling him he was trying to use a debit card as opposed to a credit card. Glancing over I could see an elderly gentleman with his nicely dressed wife standing right next to him holding on to his arm. As he pulled out another card he must have flipped it at the salesman because I then heard him say, "Oh I am sorry. I didn't mean to do that. I am just really frustrated. I had my wife at the doctors today. She has Alzheimer's." In the meantime my salesman is explaining details to me about the netbook, but I can hardly listen as my heart immediately starts to ache for this man. Sensing his frustration, I felt a need to go over to him and say, "I understand. I know what you are going through." I wanted to look into his eyes so he could see into mine and share a mutual understanding. I came so close to doing so but the timing just was off and I wasn't sure my actions would be appreciated although I was willing to chance it. By the time my salesman finished talking the couple was already heading out the door. I remember feeling tempted to run after them. Haunted was how I felt watching the husband leave with his wife shuffling along by his side. All day I kept thinking about this man.....lost dreams, lost companionship, lost conversation. How lonely and isolating it must be to be the only one to shoulder the burden of dealing with this disease. 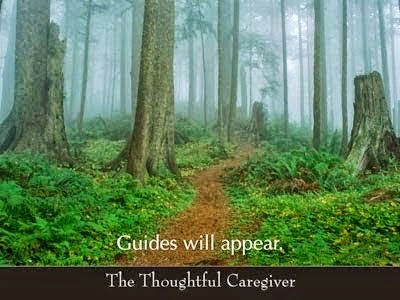 I would venture to guess most caregivers are in this situation being the ONE (as Bob DeMarco says) and the only ONE. Me....even though I am the primary ONE.....there are 3 other family members helping each in their own way with Lily. How blessed I really am.